WASHINGTON — President Donald Trump on Tuesday praised NATO countries for increasing their financial contributions to the Western alliance, but he’s still hounding them to pay even more, saying the United States still shoulders a disproportionate share of the cost of protecting Europe. The president met at the White House with NATO Secretary-General Jens Stoltenberg, who is in Washington to mark the 70th anniversary of the organization formed to counter Russian aggression. The two leaders had kind words for one another. 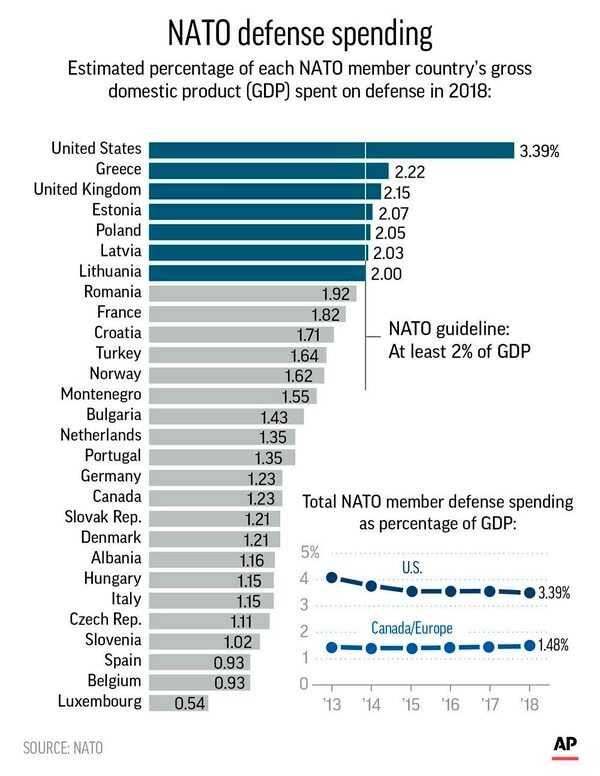 But Trump, who once suggested he might pull the U.S. out of NATO if member counties don’t significantly boost their defense spending, took aim at Germany for not raising its contribution as high as he expects. "We've worked together on getting some of our allies to pay their fair share," Trump told reporters as he sat with Stoltenberg in the Oval Office. "At some point, it's going to have to go higher." 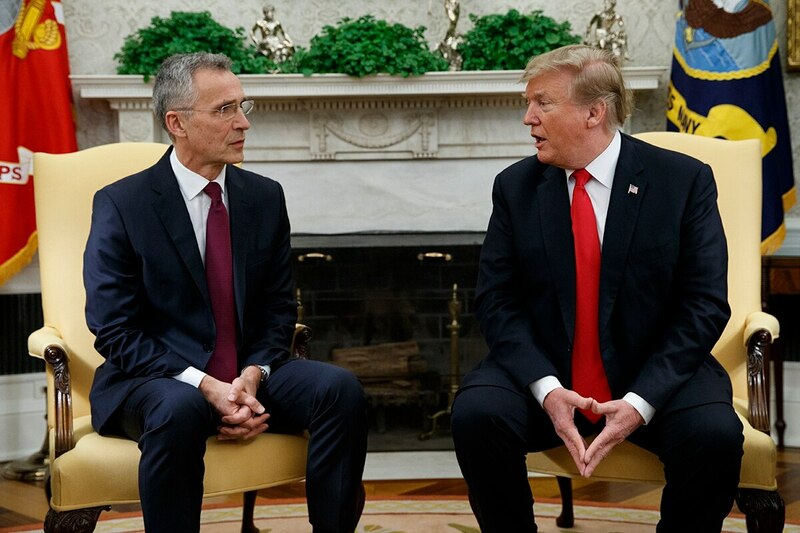 Stoltenberg thanked Trump for his "strong commitment to NATO" and for his leadership in getting member nations to increase their commitments. Spending by the 29 NATO countries, which dropped after the end of the Cold War, has actually been rising since 2014 — before Trump took office. After Russia's 2014 annexation of Ukraine's Crimean Peninsula, member countries agreed to boost defense budgets and "move toward" spending 2% of their gross domestic product on defense by 2024. The U.S. spends about 3.4% of its GDP on defense. Since Trump took office, European allies and Canada have added $41 billion to their defense budgets. By the end of next year, this will rise to $100 billion, Stoltenberg said. Germany, however, remains the main target of Trump's ire because it now plans to spend 1.5% by 2024, which is lower than the 2% guideline. "Germany is not paying their fair share," he said. "I have a great feeling for Germany, but they're not paying what they should be paying. We're paying for a big proportion of NATO, which is basically protecting Europe." Stoltenberg agreed that defense spending must rise. But he says the 2% guideline was not invented by the United States and was a target the 29 allies set in 2014 before Trump took office. Trump, who ran on an “America First” platform, has irritated European allies. He has slapped tariffs on the European Union, pulled the U.S. out of the landmark Paris Climate Accord and the Iran nuclear deal. Trump’s eagerness to get along with the Russian leader — in spite of Russia’s meddling in the 2016 U.S. presidential election and numerous other aggressive moves in recent years — has alarmed those who view Russia as a growing threat. "NATO's single greatest challenge is the absence of strong, principled American presidential leadership for the first time in its history," two former U.S. envoys to NATO, Nicholas Burns and Douglas Lute, wrote in a report on the 70th birthday for the Harvard Kennedy School's Belfer Center for Science and International Affairs. The US House passed legislation meant to bar President Donald Trump from pulling the US out of NATO. 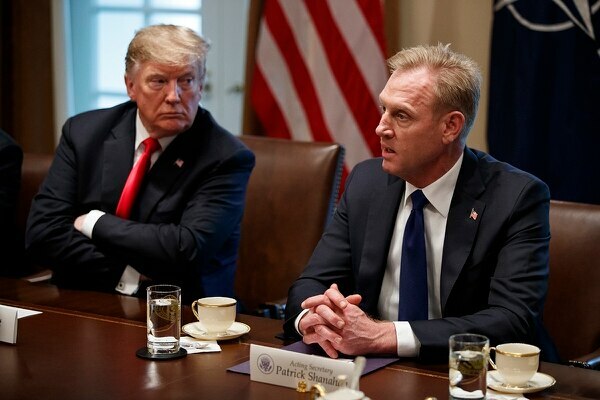 Lute and Burns said NATO leaders considered not holding a 2019 summit to mark the 70th anniversary at all because they feared Trump would "blow up a meeting in controversy as he has done each time he has met with NATO leaders during the past two years." The alliance plans a scaled-down summit of leaders in December that Trump is expected to attend. Allies see Trump as NATO's "most urgent, and often most difficult, problem," they wrote in their report. Secretary of State Mike Pompeo defended Trump, saying their conclusion was "just simply wrong" and adding that the administration has worked hard to make NATO stronger. Stoltenberg is slated to address Congress on Wednesday — a first for a NATO secretary-general. The NATO foreign ministers in Washington to mark the anniversary will be attending a reception at the Andrew W. Mellon Auditorium, where President Harry S. Truman hosted the original 12 member nations that signed the accord establishing the North Atlantic Treaty Organization in 1949. On Thursday, the foreign ministers will meet at the State Department. Their first session will focus on Russia. The ministers are expected to endorse a package of Black Sea measures to improve NATO's defenses in the region. Other topics include Afghanistan, the demise of a landmark arms-control treaty that the U.S. and Russia signed in the late 1980s and Turkey's announced decision to buy a Russian surface-to-air missile system. Turkey is a NATO ally, but the Russian system is not compatible with NATO systems and is considered a threat to U.S. F-35 aircraft. Associated Press writer Lorne Cook in Brussels contributed to this report.